The arrests come more than a year after violence broke out when hundreds of white nationalists descended on Charlottesville to protest the planned removal of a statue of Confederate General Robert E. Lee. CHARLOTTESVILLE, Va. (AP) — Four members of a militant white supremacist group from California were arrested on charges they traveled to Virginia last year to incite a riot and attack counter-protesters at a white nationalist rally that turned deadly, federal authorities said Tuesday. The defendants — Benjamin Drake Daley, Michael Paul Miselis, Thomas Walter Gillen and Cole Evan White — are part of the Rise Above Movement, which espouses anti-Semitic views and meets regularly in public parks to train in boxing and other fighting techniques, according to an affidavit written by an FBI agent. The men have also taken part in “acts of violence” at political rallies in Huntington Beach and Berkeley, California, and other places, the affidavit alleges. “This is a group that essentially subscribes to an anti-Semitic, racist ideology, and then organizes, trains, and deploys to various political rallies, not only to espouse this particular ideology but also to engage in acts of violence against folks who are taking a contrary point of view,” U.S. Attorney Thomas Cullen said at a news conference in Charlottesville held to announce the charges. All four men were arrested early Tuesday morning, Cullen said. A Los Angeles magistrate judge denied bail for Miselis, finding that he posed a risk to the community. Miselis’ attorney, Angel Navarro, argued fervently for his release, detailing how his client got his master’s at UCLA and worked as an engineer at Northrop Grumman for five years before being dismissed after his connection to Charlottesville became public. He said Miselis, Daley and other members of their group also traveled to Germany and the Ukraine earlier this year and met with members of well-known violent white supremacy groups. “What I’m concerned about is who he is now and the danger he presents to the community,” Rosenbluth said. While Rosenbluth ordered Miselis held, detention hearings for Gillen and Daley were postponed. Gillen, of Redondo Beach, chewed gum and yawned several times during his hearing, while Daley appeared agitated, frequently fidgeting and at one point turning his back to the courtroom after apparently noticing reporters and courtroom sketch artists watching him. Both their attorneys declined to comment after the hearings. Each defendant faces up to 10 years in prison if convicted on the two counts they each face: traveling to incite riots and conspiracy to riot. The arrests come more than a year after hundreds of white nationalists descended on Charlottesville in part to protest the planned removal of a statue of Confederate Gen. Robert E. Lee. 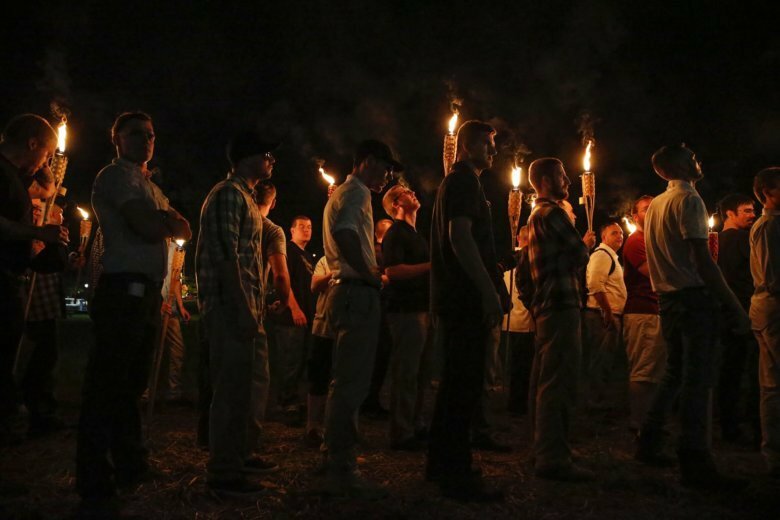 Clashes erupted Aug. 11, 2017, as a crowd of white nationalists marching through the University of Virginia campus carrying torches and chanting racist slogans encountered a small group of counter-protesters. The following day, more violence broke out between counter-protesters and attendees of the “Unite the Right” rally, which was believed to be the largest gathering of white nationalists in at least a decade. Street fighting exploded before the scheduled event could begin and went on for nearly an hour in view of police until authorities forced the crowd to disperse. Cullen said investigators sifted through “an incredible volume” of video and still photographs to review the movements of the four men and determine whether they could claim they were only defending themselves. He said prosecutors believe there was “no provocation” for them to engage in violence that day. Then they engaged in punching, kicking, head-butting and pushing, assaulting an African-American man, two women and a minister who was wearing a clerical collar, Cullen said. “In our view, these four committed particularly violent acts in Charlottesville. Secondly, they committed violent acts in California at other rallies. Therefore, in our view, they were essentially serial rioters,” Cullen said. According to The Anti-Defamation League, Rise Above Movement members believe they are fighting against a “modern world” corrupted by the “destructive cultural influences” of liberals, Jews, Muslims and non-white immigrants. Members refer to themselves as the mixed martial arts club of the “alt-right” fringe movement, a loose mix of neo-Nazis, white nationalists and other far-right extremists. Daley figures “prominently” in the organization, according to the affidavit, which also cites news organization ProPublica’s efforts to identify Rise Above Movement members involved in the violence by reviewing video footage of the clashes. The news outlet reported in July that the group was founded in early 2017 and had a relatively modest core membership of 15 to 20 young men. ProPublica and Frontline also reported in July that Miselis was a member of RAM, worked as an aerospace engineer at defense contractor Northrop Grumman’s facility in Redondo Beach and held a government-issued security clearance. A company spokesman later said Miselis was no longer employed by the company but didn’t say whether Miselis was fired or resigned. After authorities forced the rally to disband Aug. 12, a woman was killed when a car that prosecutors say was driven by a man fascinated by Adolf Hitler plowed into a crowd of peaceful counter-protesters. The suspected driver, 21-year-old James Fields Jr., of Maumee, Ohio, has been charged with federal hate crimes in the death of Heather Heyer, 32. Fields also faces state murder charges; his trial is scheduled to begin Nov. 26. The death toll rose to three when a state police helicopter that had been monitoring the event crashed, killing two troopers. President Donald Trump sparked a public outcry after he blamed both sides for the violence. An independent report released three months later found serious police and government failures in responding to the mayhem. Kunzelman reported from College Park, Maryland. Associated Press writer Sarah Rankin in Richmond, Virginia, and Amanda Lee Myers in Los Angeles contributed to this report.